Eight Grassroot Soccer (GRS) graduates and three staff members from communities across Southern Africa came together last week to form the GRS delegation at the Football for Hope Festival. This diverse GRS group joined 31 other teams of young people from around the globe for a two-week event that will celebrate and showcase the power of soccer to create social change. 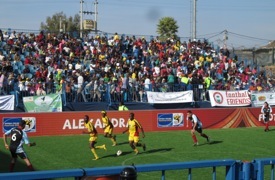 The festival is being held at a specially constructed stadium in the township of Alexandra, South Africa and will feature participants from international organizations using soccer as a method to address critical world issues – from spreading awareness about the dangers of landmines in Cambodia to providing leadership training to young girls in Kenya, to facilitating integration for refugees in Australia, the groups represent diverse communities and highlight the far-reaching power of the world’s most popular sport. The multi-national GRS delegation will be especially well-prepared to take advantage of the Festival’s focus on intercultural exchange and understanding. Most of the teams in the tournament have members from only one nation and many from just one program site. With four players from South Africa, two from Zambia and two from Zimbabwe, each individual on the GRS team brings their own culture, life story and unique Grassroot Soccer experience to share with the team. The participants spent the first several days engaging in cultural and educational activities with the other delegations including painting and photography workshops, story-telling and live performances from 16 of the 32 nations represented. These exchange activities will certainly provide Chipunda with the opportunities she seeks. This week the teams began their participation in a fair-play soccer tournament that parallels the World Cup. Team Grassroot Soccer has seen tough competition in the matches, but the purpose of games at this tournament go far beyond winning and losing. The mixed gender squads will be responsible for their own refereeing and have the opportunity to award a fair-play point to the other team as ways to promote effective conflict resolution and intercultural exchange. For GRS team-member, Laishon Banda, the tournament provides an important opportunity to “display our abilities in playing football to foreign countries” and he hopes it will help him to realize one of his biggest dreams, “to be able to play international football in Europe and hence using my talent to reach out to many nations and spread the message about HIV/AIDS. An official event of the 2010 FIFA World Cup, the Football For Hope Festival is organised by FIFA, streetfootballworld, the Organising Committee of the 2010 FIFA World Cup and the City of Johannesburg.